This rectangular chambered cairn is now roofless: the upright slabs dividing it into four compartments are clearly visible. The 3m long entrance passage enters the chamber at the north end of the chamber. At the opposite end is a small cell, measuring only 1m x 1.1m. After the final burial, the roof was removed and the tomb filled with earth and stones. During excavations, human and animal bones, deer tines, sherds of pottery and some other artefacts were found. 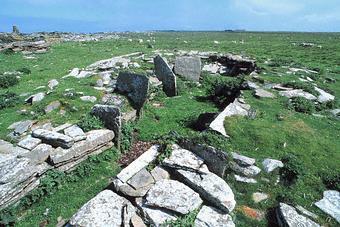 At the south end of the islet is the larger Holm of Papa Westray South chambered cairn.